Waverly and Kieran are aboard The Empyrean when the ship is attacked by their sister ship, The New Horizon. Told through dual perspectives, Waverly and Kieran are separated and try to fight their way back to each other and family. Waverly and all of the other children are whisked away to The New Horizon where they are all told The Empryean was destroyed and there are no survivors. Kieran, who is Captain-to-be, is left aboard the injured The Empyrean with other young men trying to help the injured and find the young girls and children that were taken. Kieran has his own battles to fight when other boys aboard the ship challenge his authority and leadership. Glow had a really quick start with a good story making elements. All in all, I would have preferred to stick with Waverly's story. I found myself bored with Kieran and his struggle to gain control over the other boys. Waverly's story line was much more interesting and the characters aboard The New Horizon were much more intriguing than the testosterone fueled boys on The Empyrean. The New Horizon is ruled by a soft spoken, bible-wielding lady named Pastor Anne Mather. Now, I liked her a lot! She is mysterious, devious, and Waverly's interactions with her were entertaining. Total power struggle! This book ends on a pretty big note. I was a bit taken back by it all. Not sudden, but the actions of Waverly just blew me away. I'm not sure her parting note fell in line with her other emotions and actions in the book, but it certainly leaves you excited for book two, Spark. I felt Waverly's voice, played by Ilyana Kadushin, was a little mature for being a 15-year-old girl. Although, it was superb for Anne Mather. Interestingly enough, Ilyana Kadushin is the voice behind the Twilight saga! Matthew Brown provids the voice of Kieran. I just listened to The Fox Inheritance where he also narrated. It took me a few discs to think I wasn't listening to Locke. I really wish this book wasn't compared to The Hunger Games. That's like comparing every YA paranormal with a vampire character to Twilight. I know publishers are looking for the best next thing, we all are, but dubbing a book just as good as a worldwide bestseller/phenomenon is setting it up for scrutiny/failure. 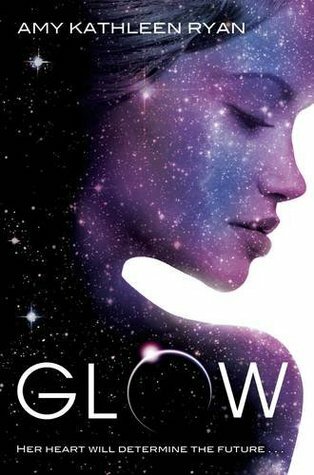 I like Glow and I thought the plot was interesting enough without the sizing up. I think reviewers and readers might have went into reading on a more neutral note without the blurb. A note about the book covers; I'm happy the first edition got a new look. I really wasn't sure what was going on in that glowing "O." I like the sparkly cover above, but not sure that really captures the heart of the story either. Version three, the paperback, looks to go along with book two, Spark.